Where to buy boxing reaction balls? The “Fight reaction balls” simulator is designed to train accuracy of impact and speed of reaction. It also contributes to the formulation of the right punch. This simulator is especially necessary for all those involved in percussion areas: Boxing, Kick-boxing, etc. The sports simulator is universal, ideal for training adults and children, professional athletes and amateurs. 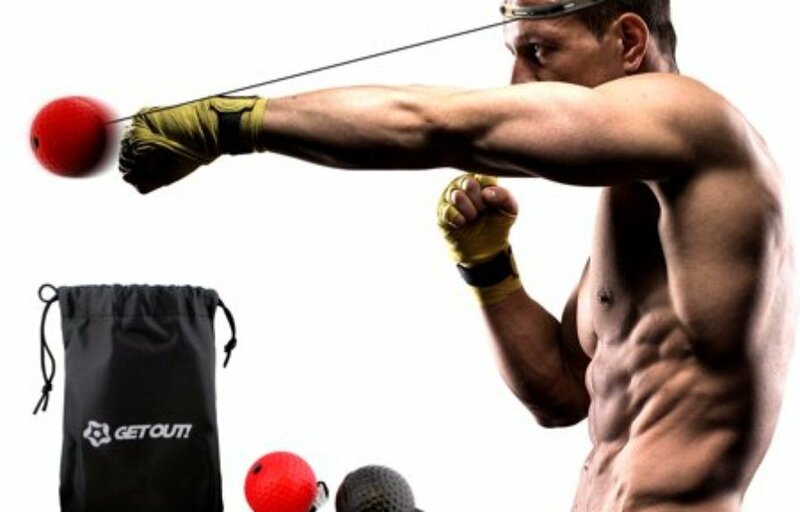 The Fight reaction balls simulator trains very important qualities necessary in combat – speed, coordination, accuracy, sharpness. Use the simulator is necessary for combination with other exercises, then there will be real benefits. The boxing reaction balls simulator is very easy to use and store due to the fact that it takes up very little space. He is amazing because of his property that both professionals and beginners are actively and with pleasure working with him. Whatever martial art is involved in – it will always provide invaluable service and assistance in training reaction and developing coordination. And if the choice falls on an impact sport, such as boxing or kickboxing, it will help train the speed and accuracy of the strike. The reaction balls simulator is a ball attached to an elastic band. The second end of the gum is fixed with a headband. So, putting a bandage on his head, we have in front of us a ball hanging from an elastic band. The length of the gum needs to be adjusted so that the ball reaches the navel. In order to adapt to the simulator, it is necessary to hit the balls lightly. The ball, bouncing off the impact, will stretch the gum and go in the opposite direction, towards the striker. Advice for beginners: start to beat not strongly, in order to have time to react to the returning ball, which will fly to your face. And it is better to carry out the blow, aiming at the center of the ball and directing it down, so that it would fly back a little above the face. When the ball comes back, your task is to hit it again. Thus, we get used to the simulator, working with him for ten-fifteen minutes a day. After you have adapted a little to the fight ball simulator, increase the force of the blow and hit the ball straight, you can alternately beat with one hand and the other, draw your own combinations. You can try to beat and side punches. Work with the simulator for up to twenty minutes a day. It is time to learn, between the blows, to return the hands to the chin, occupying a protective stance: the fists protect the head, the elbows – the torso. So, your task at this stage is to work according to the scheme: strike – defense – strike. We reach this exercise to perfection. You are doing well. Now we learn to move. During the blows we move around the room, performing jumps in the rack, while not forgetting to return hands to defense. 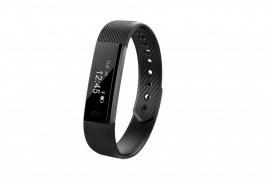 There are a lot of stores available online, as well as in any city where the sporting interval is sold. Amazon is America’s best online store where you can buy such a product. IMPROVED NON-SLIP, ADJUSTABLE HEADBAND: Their non-slip technology guarantees the headband will stay secure on your head during training for a more efficient workout. The adjustable headband ensures it to fit for any size head. D-Ring system makes attaching and adjusting strings simple and easy. TWO TRAINING BALLS FOR DIFFERENT DIFFICULTIES WITH ADJUSTABLE STRING: The lighter black ball (0.8 oz.) is good for beginners and children. The heavier red ball (2.8 oz.) allows for the increased difficulty to burn more calories while you workout. Both balls come with an adjustable string that can fit any arm length. TWO HIGH-QUALITY HAND WRAPS TO PROTECT YOUR KNUCKLES: Enjoy longer training sessions with their easy to use hand wraps to protect your knuckles. The hand wraps to ensure a comfortable boxing experience for everyone. Easy to follow instructions allow for quick wrapping. FUN, EASY WAY TO IMPROVE YOUR HAND-EYE COORDINATION: Tired of the same boring workouts? Their product allows for a new, innovative, and fun training experience to improve your reflexes and hand-eye coordination. 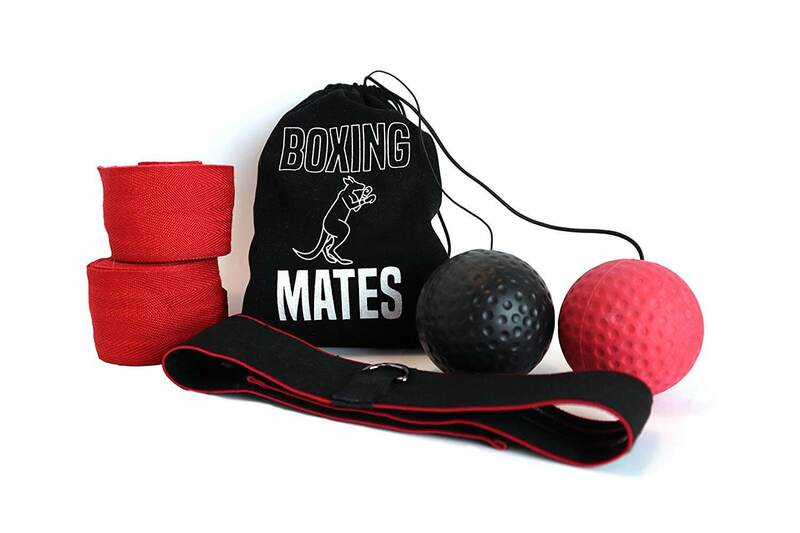 Why Choose Boxing Mates: Boxing Mate’s Non-Slip technology paired with our adjustable string allows for a workout far superior to anything the competition offers. Additionally, Boxing Mates is owned and operated in the United States, meaning we are able to effectively communicate with the customers in order to satisfy their demands. 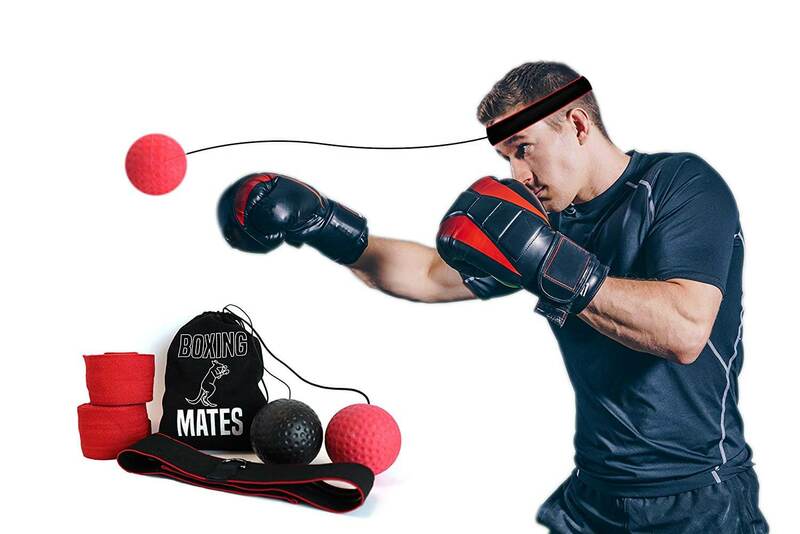 What are the Benefits: These boxing reflex balls are not only designed to help improve a boxer’s agility and hand-eye coordination but also is an effective tool for burning calories for everyone. Boxing Mates guarantees that everyone will be able to get a good workout with this product. Now you are almost a pro and can afford to train the slopes of the returning ball, hit the ball on the wall and dodge it while working with the simulator, turn on the TV and, distracting on the screen, learn with side vision to respond to the flying ball.